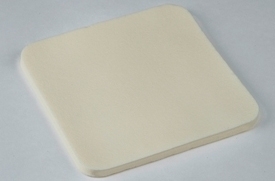 KendallTM AMD Antimicrobial Foam Dressings are an open cell polyurethane foam dressing and is impregnated with 0.5% Polyhexamethylene Biguanide (PHMB), a highly effective, low toxicity antiseptic. They help support efforts in managing both moisture and bacterial balance. The dressings are effective against gram positive and gram negative bacteria and also work against fungi and yeast. The dressing works when the foam absorbs the wound fluid and the PHMB binds to the foam material and kills bacteria. They have been proven effective against repeated contamination for up-to seven days. KendallTM AMD antimicrobial foam dressings are indicated for use in management of post-surgical incisions, pressure ulcers, venous stasis ulcers, diabetic ulcers, donor sites, abrasions, lacerations, 1st and 2nd degree burns, dermatologic disorders, other wounds inflicted by trauma and, as a secondary dressing or cover dressing for packed wounds. It is an ideal dressing in the local management of exudate that may occur at surgically induced body exit sites such as tracheostomy, G-tube, J-tube, Penrose drain, chest tube, nephrostomy tube, sump drain, IV catheters, central venous lines, arterial catheters, dialysis catheters, peripherally inserted coronary catheters, mid-line catheters, externally placed orthopedic pins and epidural catheters. -KendallTM AMD antimicrobial foam dressings can be used in conjunction with prescribed therapies for the treatment of infections. Dressings are not intended as a primary treatment for infections; if clinical signs of infection are present, please consult a physician.